Good downwind performance can be the difference between being first across the line or being pipped at the post. It doesn’t matter if you’re a racer or a cruiser, the vast choice of spinnaker types and designs available today makes choosing the right spinnaker complicated. Choosing the right sail for the conditions is the difference between winning and losing, or between languishing out at sea and being safe on your mooring. These sails are designed for very light winds and are normally manufactured from 0.5 oz spinnaker nylon. They are designed with a medium fullness and moderate head angle and shoulders so they fly easily in very light winds. You need to sail tighter true wind angles (TWA) to get the best performance from these spinnakers. The optimum wind range and angle for this design is 1 to 8 knots true wind speed (TWS) and 80 to 150 degrees TWA. These sails are designed for light to medium running and are normally manufactured from 0.6 oz spinnaker nylon. They are designed with maximum fullness and large head angle with big shoulders so that they fly with maximum projection and power. The optimal wind speed and angle for this design is 5 to 18 knots true wind speed and 170 degrees TWA. These sails are designed for reaching and are normally manufactured from 1.0 oz spinnaker nylon or laminate spinnaker fabric for larger boats. This design is much flatter with a smaller head angle and less shoulders than a running spinnaker. The optimal wind speed and angle for this design is 9 to 24 knots true wind speed and 85 to 135 degrees TWA. 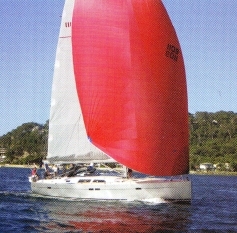 These sails are designed for medium to heavy running and are a maximum are spinnaker. They are normally manufactured from 1.0 oz spinnaker nylon. 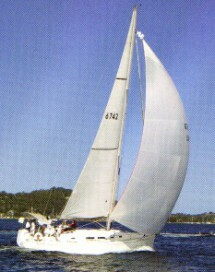 Laminate spinnaker fabric is often used for larger boats. This design is full cut with a large head angle and big shoulders for maximum projection and power to help get the boat downwind fast. The optimal wind speed and angle for this design is 18 to 26 knots true wind speed and 130 to 170 degrees TWA. These sails are designed for very heavy running because of their reduced size, flat shape and extra strong construction. They are normally manufactured from 1.5 oz. or 2.2 oz. spinnaker nylon or laminate spinnaker fabric for the larger boats. The optimal wind speed and wind angle for this design is 25 to 35 knots true wind speed and 95 to 170 degrees TWA. These sails have been around for about ten years and are now becoming very popular with racing sailors. 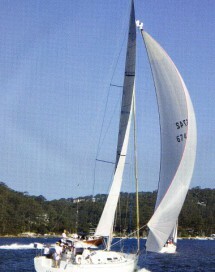 The Code Zero is a spinnaker-genoa hybrid; designed to operate like a genoa, but considered a spinnaker under racing rules. The Code Zero helps a boat’s performance in tight reaching angles, especially in lighter winds by generating much more speed than a slightly eased headsail. We have found that these sails reach very well in a moderate wind and their shape and size make them a very effective heavy weather running spinnaker. We fit a low stretch Vectran line in the luff and the sail is tensioned quite firmly to get a straight luff (a lot like a genoa). It has a mid girth of 75% of the foot length so it measures as a spinnaker, but has a much bigger area than a genoa. We design them to be quite flat for a spinnaker with a straight leach exit. They are normally manufactured from a laminate with Kevlar Spectra and Technora yarns for very low stretch. The optimal wind speed for this sail is 3 to 25 knots true wind speed and in lighter winds you can carry this sail up to 45 degree TWA. 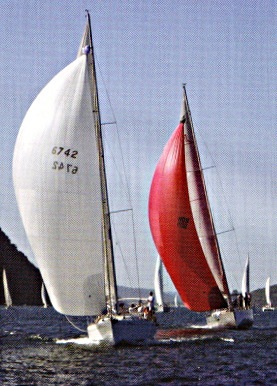 Asymmetric spinnakers are becoming a lot more common as sail designs become increasingly refined, and improved handling techniques make using these sails easier than the conventional symmetric spinnaker. With the latest design advances we have found that the new 2A design runs as deep as a 2S Spinnaker and just as fas; This is mainly due to the 2A having a lot more area built into the luff, so when the sheet is eased the sail rotates to windward projecting much more of the spinnaker. On a reach asymmetric spinnakers perform better than symmetric spinnakers. They have a longer luff which lowers the centre of effort of the sail and a straighter leech exit profile. This allows the shape to exhaust much better, reducing sideways force and thus allowing the boat to sail faster. For cruisers, the ease of handling an asymmetric spinnaker, particularly when fitted with a sock, makes the asymmetric a no-brainer. Jibing is simple: you ease the sheet off as the boat is pulled awayuntil it is dead downwind then let it run and pull on the new sheet as the boat is coming up to the new downwind angle, so the spinnaker floats around the outside. When practiced two people can pull off this manoeuvre with ease. Hoisting and lowering the spinnaker is painless with a snuffer. Running with the newer designed asymmetrics is also easier because the newer designs allow you to sail much squarer than the older designs, even with the tack line off the bow of the boat. 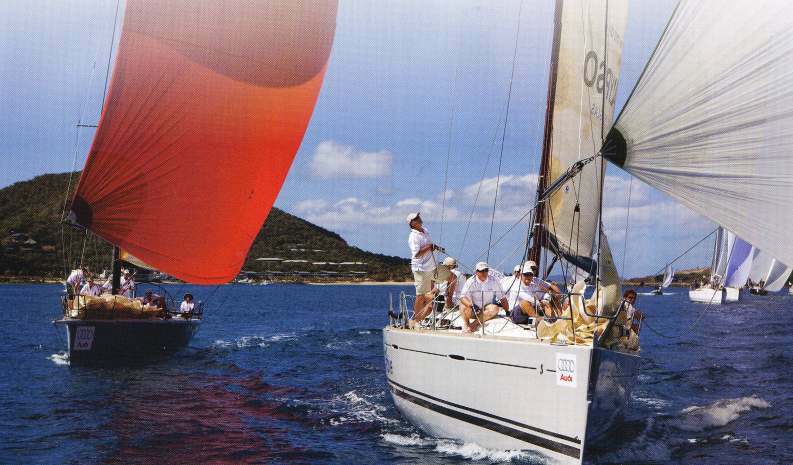 For most cruising boats we recommend a slightly heavier version of the 2A as a good all round, cruising spinnaker. Tweekers can assist in sheet trim. They should be placed near mid-way around the point of maximum beam. Well-designed asymmetrics can be used from 95-170 degree true wind angle Tweekers can assist in sheet trim. They should be placed near mid-way around the point of maximum beam. For those sailors who want a spinnaker that is suitable for both cruising and racing, we recommend a 2S/2A and a 5S/5A, depending on the set up of the boat. These two spinnakers cover the majority of the 2-25 knot wind range, and if longer offshore passages are being considered or more performance is required, we’d recommend a 3S/3A. Notice how the lead boat’s sail is fuller in the head giving it more power than the red spinnaker behind it.